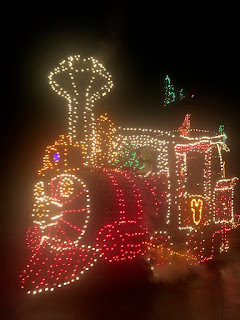 For this Disney Photo of the Week, we go back to the final run of the Main Street Electrical Parade at Disneyland. The parade had played at both parks at the Disneyland Resort during its history as well as at the Magic Kingdom at Disney World and in New York City but it had changed over the years, specifically the Casey Jr. float. The words on the drum were changed and extra lights were added to represent pixie dust to deal with changes to the parade over the years. But for the final run of the parade, the train was restored to its original glory. The original words were brought back to the drum float and the pixie dust was not used. It even became the first float in the parade. Casey Jr. became the last Dumbo float but was showcased even more in advertising then it ever had been before.